Viking women were not allowed to take part in battle, but if they conquered new land, women would have to come so that a permanent settlement could be build up.Women would have taken their children and all their live stock with them, so the voyage over the sea would not have pleasant. Women would only have gone on peaceful immigration trips, rather than raids. But for example in england, there is evidence(in the form of women's jewelry)that viking women were there by the 10th century.The viking word for woman was Ginna. Pagen graves are wonderful, as they give us insight into the cultur of the vikings. In scotland there were two female graves found, of very diffrent women: the young, stout and wealthy mother of newborn twins from Westness, and the high-status, elderly woman from Scar, buried in a boat along with a younger man and a child, a matriarch, perhaps even a priestess of Freya. The mythological poem Rígsþula, written down in medieval Iceland, accounts for the divine origin of the three main social classes. But it also gives us a snapshot of daily life in the Viking Age. The woman of the slave-class wears 'old-fashioned clothes' and serves bread that is 'heavy, thick, packed with bran... in the middle of a trencher', with 'broth in a basin'. The woman of the yeoman class wears a cap and a blouse, has a kerchief around her neck and 'brooches at her shoulders', and is busy with her spindle, 'ready for weaving'. The aristocratic woman is just busy preening herself: she wears a blouse of smooth linen, a spreading skirt with a blue bodice, a tall headdress and appropriate jewellery, and has very white skin. She serves silver dishes of pork and poultry on a white linen cloth, washed down with wine.The standard Viking Age house was rectangular and had just one room, in which everything took place around a central hearth. This house type has been found from Sweden in the east to Newfoundland in the west, in both rural settlements and in towns such as York and Dublin. As in most traditional societies, women spent much of their time indoors in such houses, cooking, making clothing and caring for children and the elderly, but they would also have had responsibility for the dairy. 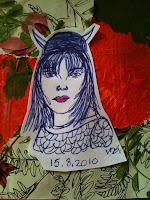 Yesterday I drew the viking woman above and I just love how she turned out and enjoyed the way in which I drew her. I want to draw one girl like this a day. What I do is take an image from a magazine and draw it using a cheap biropen. I cannot rub any thing out and have to accept the flaws and this really helps me love my drawings. 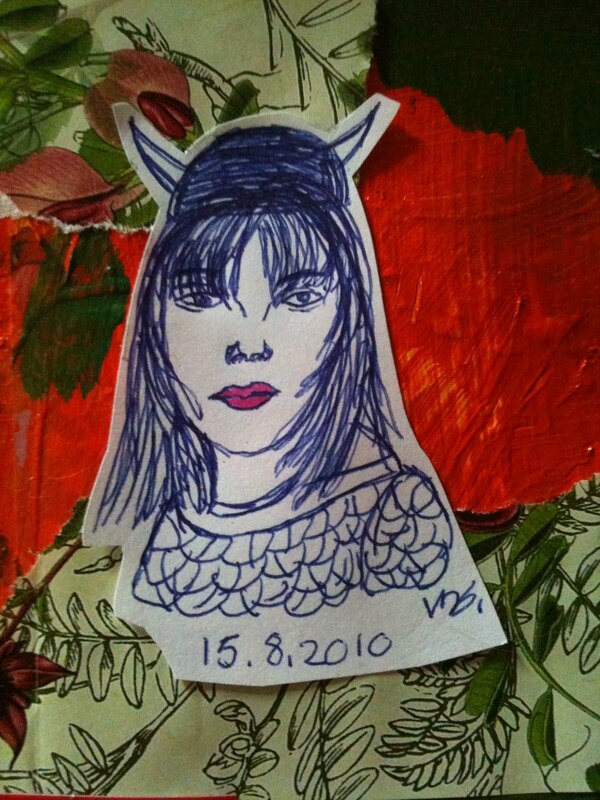 When the image is complete, I have a good look at her and if she looks to me like something, in this case a viking, I add the feature needed to show this, in this case a viking helmet. I use an artists pitt pen to colour in one feature that I want to stand out. I love drawing in biropen!! Here is my first ever vid!!!! This is just a cool technique I thought of and thought it would be fun to share!! The possiblities are endless and free!! Loorolltubes are not the only item of waste you can salbage for your art! What do you like to use? If you try this technique, please share photos,what are your suggestions on how to use? Art supplies i am loving at the moment , a journal page and handcarved stamps!!! 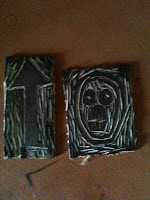 Last week I finally got round to carving my own stamps. YAY!! 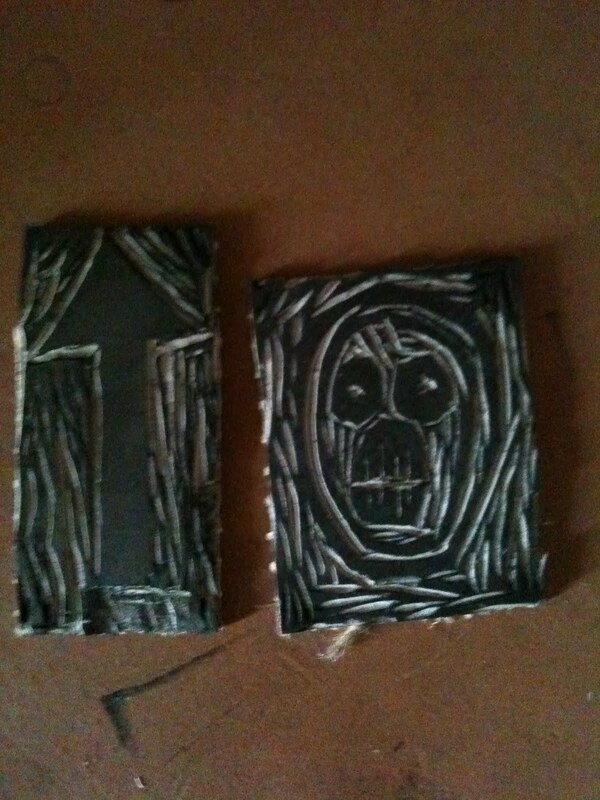 I simply bought a piece of lino, cut down to size, drew on image and started to carve away. It was so much fun and very simple.I did find this vlog video by samantha kira very useful.But it really was so easy and fun. If you have never carved a stamp before, I recommend you watch the video by samantha kira, go abuy the supplies and get carving. I carved an arrow and a Mighty Boosh head( if you do not know this, watch a vid of it on youtube and you will laugh your head off!! !Link at end of article). 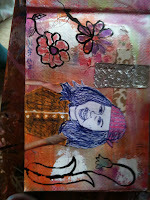 I have also created this cool journal page. 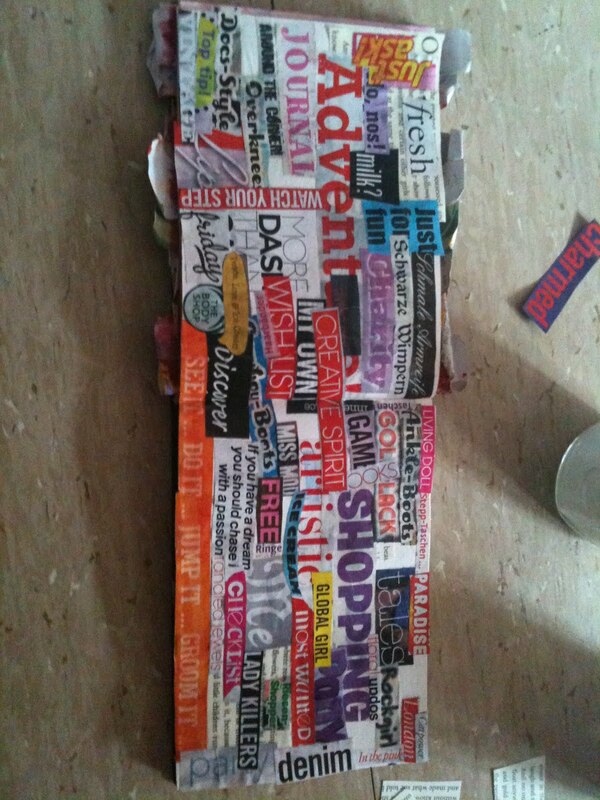 I had so much fun creating it. 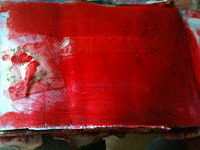 First I scribbled around a bit with watersoluble neocolours and then I dry brushed some gesso over it. I did a biro pen drawing of a girls face and added a coloured bookpage t-shirt. i created the flower and then played around with pen and ink. Lastly i coloured in a few things with artists PITT pens. 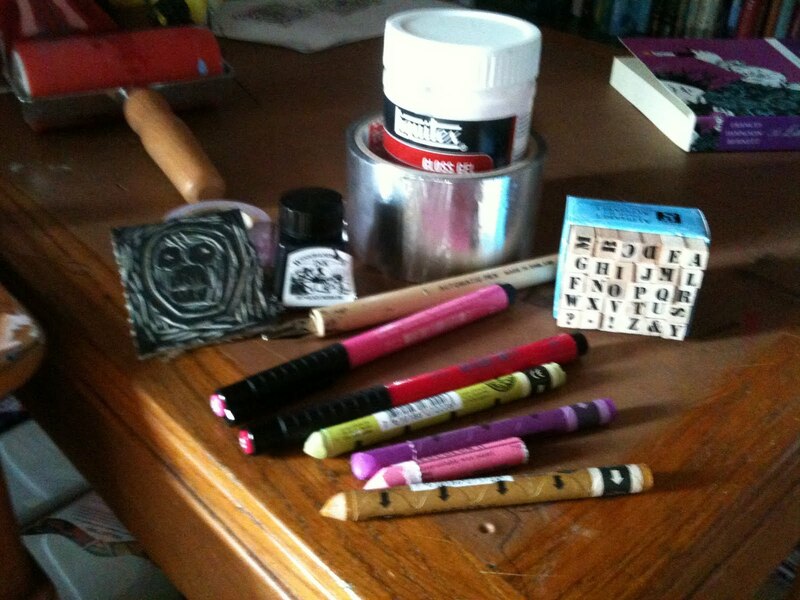 These are a few art supplies I am loving lately. Mini alphabet stamp set(reat for spelling out words or to use for journaling instead of your own handwriting. ), neocolours II in lots of cool colours, artists PITT pens in lots of colours, my brand new aluminum tape, pen and ink, gel medium and carving stamps!!! What art supplies are you into at the moment? Do you have any blogpost requests? 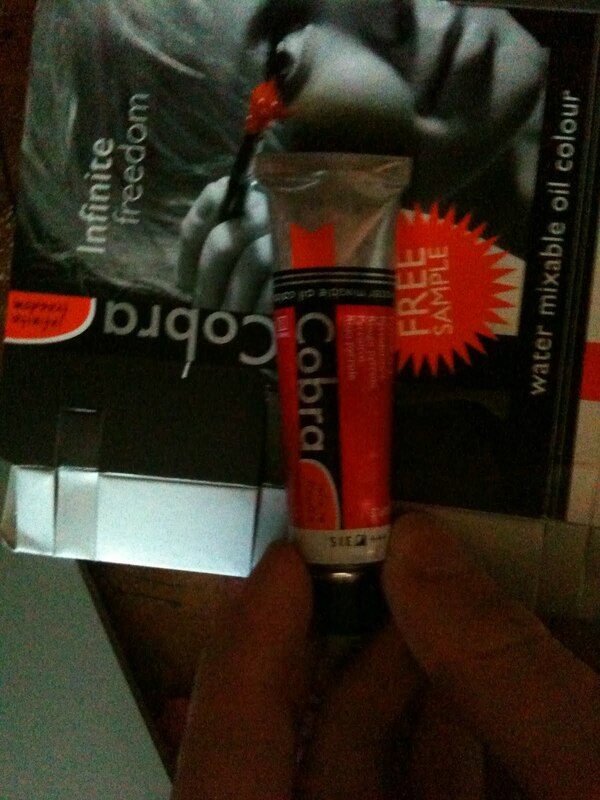 I saw this free sample Cobra paint tube today, when I was browsing my local art shop. I took a sample of course and as soon as I came home, I started testing out roughly how they work. But basically they are water mixable oil paints. It also says on the packaging that they wash out of fabric with water. This makes me so excited, because I am always getting acrylic paint on my clothes and this puts me off painting a bit, but only 0.1%. All the same, if it will wash out, this makes me super happy!!! 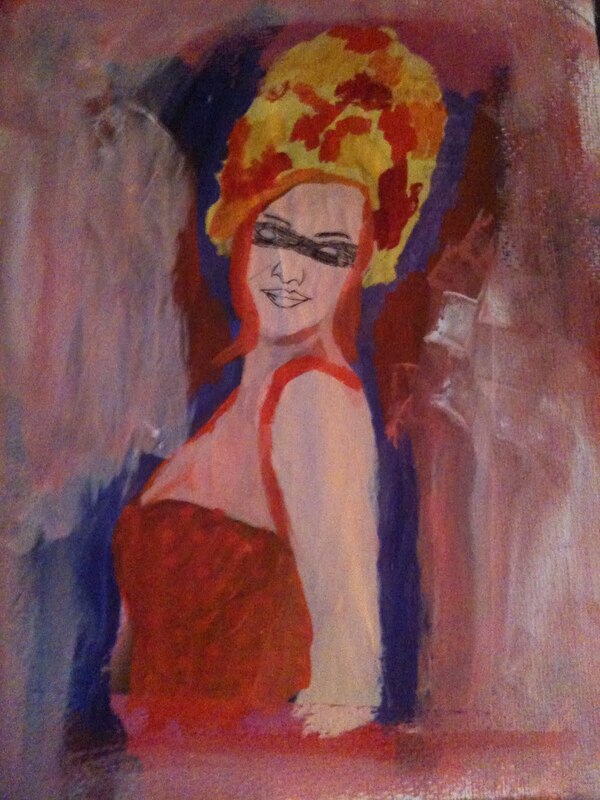 Anyway, I tried the paint out and it acts like a mixture between acrylic paint and oil paint. It still takes a while to dry, it has than oil paint glossiness about it and lets itself blend together like oil paints, but it blends well with acrylic paint (i did do this, but with an orangish red acrylic paint) and I have worked with both acrylic and oil before and when working with this, it just feels like a really fantastic feel to it. 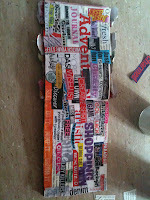 I friking LOVE this paint, when I next go there, I will buy myself some of this. 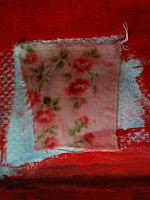 Now onto the next claim: it washes out of fabric.I am so happy about this factor and I tried it and it works. Above you can see before and after of a piece of fabric which I put some paint onto and then washed out. There is a kinda orangish tint to it, which was not what happend, the glue (I used my homemade glue, yay it glues fabric to:)), which I brushed over it, blended the colour onto the fabric. But before I glued it on, it had one tiny spec of paint on it. Click on the image and look at it in big and take a good look at it, you will see the effect. I give these paint 8 out of 10. I will go buy some more of this, will you? Have you tried this paint before? What did you think? I have been a vegetarian for about 6 weeks and it is therefore high time to tell you all what it means. Basically if you are a vegetarian, you cannot eat any meat, shellfish and sometimes fish( I have decided to eat fish for now) or glycerin( in jelly and gummi sweets and marshmallows) and you cannot buy any leather. So you need to make a few lifestyle changes.You cannot continue your normal diet and just leave out the meat. Because you body needs the nutrients in the meat to function,, so you need to eat other foods to replace theses nutrients.Lets have a little look at at what nutrients you need, why you need them, where to get and how much of it to eat. Carbs: This stuff gives you energy and heps in bone/cartilage/nerve building and general body maintenance. Sources of carbohydrates are potatoes, root veg,bread,grains, pulses, whole grains,cereal, pasta, rice, noodles, fruit, oats,lentils, fruit, dried fruit, some dairy(such as milk), nuts, seeds and mushrooms. Should be a third of your daily diet. Fruit and Vegetables: Prevents diseases,boost immune system, good for hair, skin, bone strength and is packed with vital vitamins, minerals, fibre, calcium, zinc and potassium.Every fruit will contain some of these, so just make sure you eat about 6 pieces of fruit or veg per day. Milk and Dairy(calcium): Strengthens bones and teeth, contains lots of calcium, nutrients and minerals. Everything dairy so milk, cheese, yogurt, soy milk,soy beans, leafy green veg, sesame seeds, tahini, almonds, tofu, bread, oats, watercress, dried apricots,figs, brazil nuts, pistachios, pecans.Eat about 2 portions per day. Protein: Growth, muscular repair,metabolism( essentials for growing and maintaining health).Complete protein found in quinea, egg whites, soy beans, soy protein. Incomplete protein(which has to be combined with another food group to release proteins) in dried/tinned beans, chickpeas, lentils, tofu, nuts, seeds,couscous, bulgur, wheat, whole grains, cereal, eggs,baked beans,yogurt, hummus, milk, cheese, broccoli, beans sprouts, peas, seaweed, sweet potato, dried apricots, avacado and miso. Eat 2-3 portions a day. Fat: Essentials foe maintaning the body's processes- energy,activating vitamins and insulation. 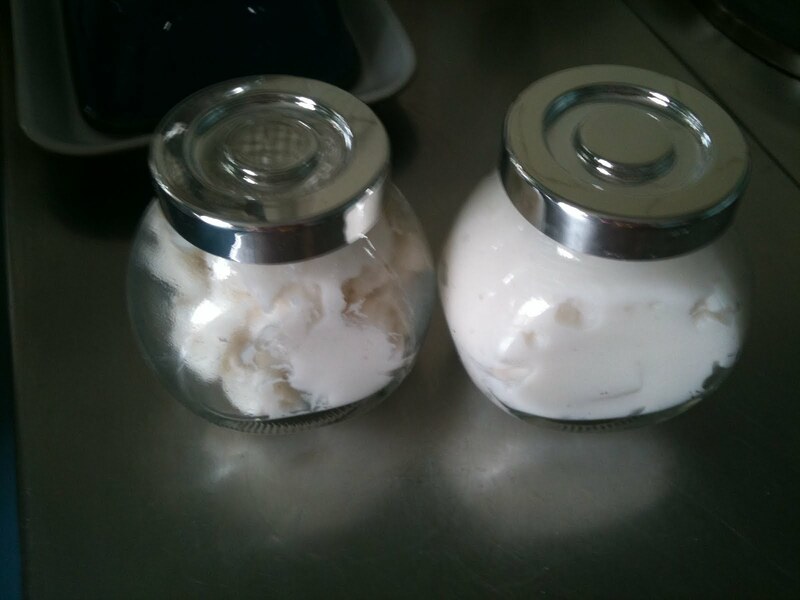 Can be found in butter, vegtable spread, soy milk/spread/oils. Cheese, cream, olive, rapeseed, sunflower oils and avacado. Eat 2 portions a day. Iron: Low-iron diets can cause anaemia( its hard to focus, you feel and look flaky, no energy). Iron needs to be aeten with Vitamin C , so your body can absorb it. Vitamin C in orange/juice, kiwi, strawberry, potato, cabbage, broccoli, tomato, melon, asparagus, peppers, mago and black berries.Iron in Nuts, seeds, raisins, eggs, spinach, kidney,beans, chickpeas, black treacle, lentils,peanut butter, hummus, wholemeal flour, watercress, broccoli, spring beans, okra, spinach, breads and olives. Eat 2 portions a day. Selenium: Boosts your immune system. In nuts(2 brazilnuts a day would cover it), wholemeal bread, eggs and brown rice. Eat daily. Vitamin B12: Needed for nervous system and to keep blood healthy.Can be found in Eggs,dairy products, Vegemite, Marmite, soy milk, veg and sunflower seeds. Eat daily. So there you go , that is a basic outline of what you can eat. If you want me to, I will create another post with some recipies and ideas on how to get all these foods into your diet. 1. In a pot, combine rice flower, sugar and water. Stir until there are no lumps. 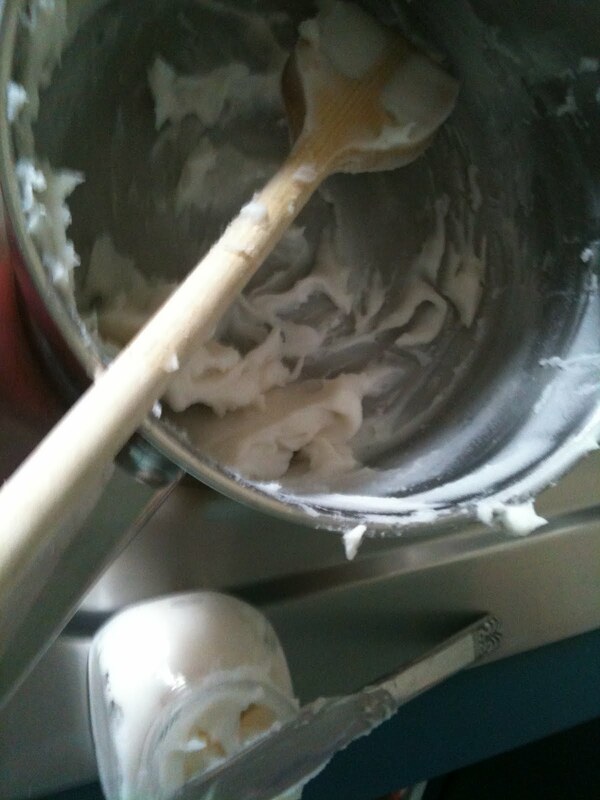 2.Stir over low heat until mixture has thickend. 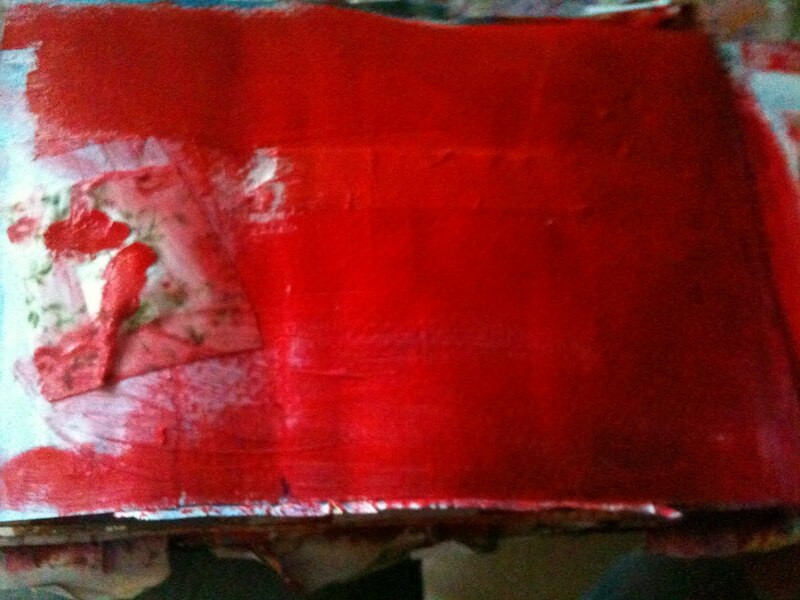 My glue was way to thick at this point, so I had to add more water, but once I had it was fine. 3.Remove from heat and mix in a few drops of essential oil. 4.Allow mixture to cool, then pour into a jar. You should have about a butter-cream consistency. 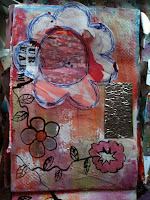 Creative Block?! 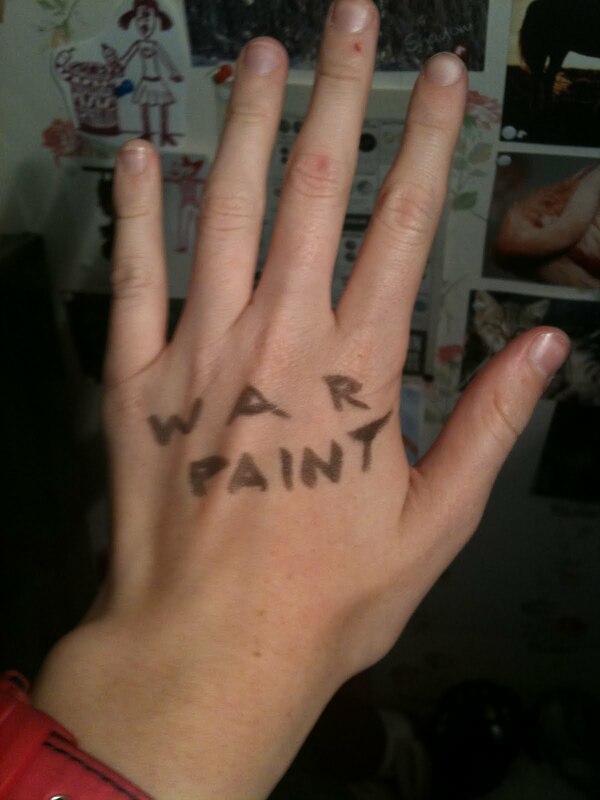 GET YOUR WARPAINT ON!!!!! Over the past two or three days I have just been sitting round reading magazines and watching youtube videos on how to sew clothes( yes I want to try) instead of acctually creating anything. 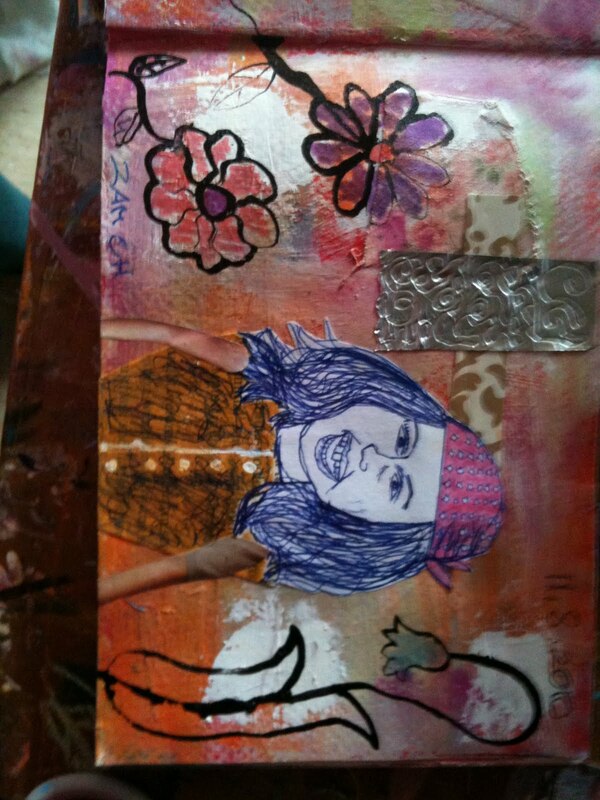 I did do the picture above in my art journal, but it is horrible!!! !Ans more importantly I made myself do it and it was not fun. It is time to rise up and put some warpaint on ( aka liquid eyeliner) and get creative. Sounds fun huh? 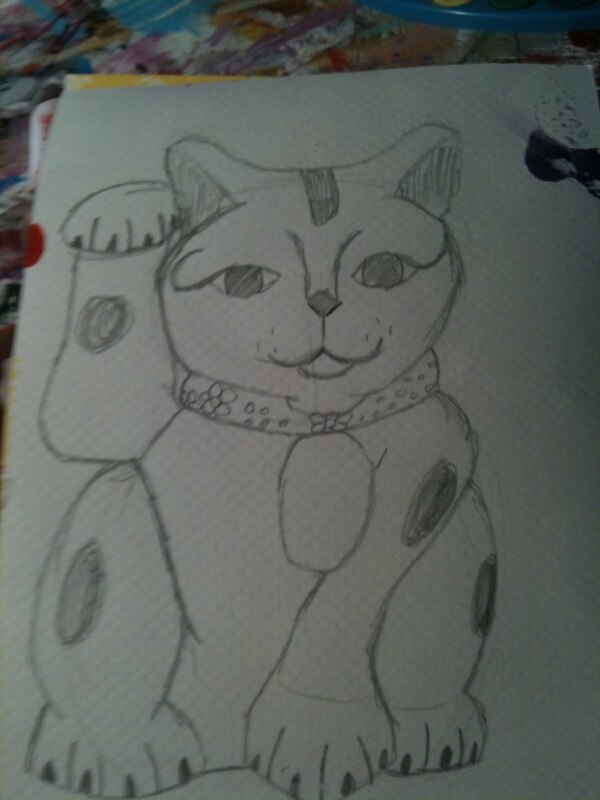 So I went on google and found a cool pic of this cat and drew it. Better than the girl painting and it was fun!!YAY!! So my tip for creative block: Go onto one of your fave art journaling websites, pick a post they did that looks fun and for which you have all the supplies, turn the music up and start mindlessly working.And voila!!! 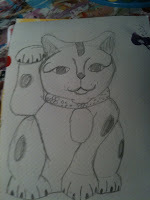 At the moment I am really into japan, so i did a bit of research about this cat. Maneki Neko: means Beckoning Cat aka Welcoming Cat, Lucky Cat, Money Cat and fortune Cat. The raised paw is not a greeting, but has a meaning. If the left paw is raised it means the statue or image will bring customers into a shop( they are commonly placed outside shops for this reason)and if the right paw is raised, it means wealth and good luck. A lot of people think that, the higher the cats paw is raised , the greater Luck or the greatest distance good fortune will come from.The cat normaly has a red collar, which may be red because it reminds of the red flower hichirmen, which was popular during the Edo period when it was first created( 1603-1867) and a bell and/or bib. The bib may be something to do with the bib which grateful parents are said to give to Jizo Botsatu, the protector of sick children. The histiory of this cat is mysterious. It could be because emperors and other important people say that someone passed a cat, that was waving at him. thanks to being distracted by this cat, the man did not walk into a trap. Thats why cats are considered wise and lucky spirits. I can't argue with cats being wise and lucky spirits! I got the info from Wikipedia, there you can also read about the 3 legends around the actual cat statue. So that did it for me. How do you go to war with your creative block? Thoughts about BLOGGING on Genuine Major!